This brochure explains our organization, who we are, what we do, how to contact us and how you can join us. 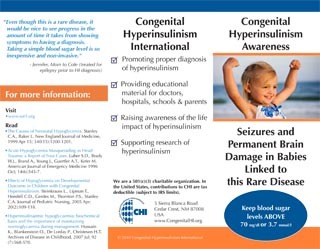 These brochures are also used to raise awareness of the condition. Contact us if you would like us to send you some to share with your friends, family, or school or workplace. You can also share them with your local physicians. Click on the image at right or click here to view the English version of this brochure. Click here to view the French version of the same brochure. We call this the First Responders’ Brochure. 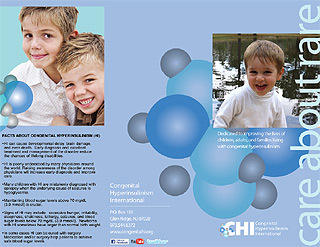 This was our initial brochure and was used to familiarize doctors and nurses with the signs and symptoms of congenital hyperinsulinism. Click on the image at right or click here to view the English version. Click here to view the French version. Click here to view the Spanish version.